I keep seeing those "Should Trump be impeached?" polls popping up on various websites. I think I've even seen a couple in the form of AdSense ads here. It seems like a poor question, or at least one that is incomplete in some important ways. We don't get to impeach someone just because we don't like them. There has to be evidence that they have committed certain types of crimes to open that door. How someone answers this question ought to have something to do with whether they believe Trump committed such crimes. I would guess that many of the people who respond to that poll question by saying "no" do so because they do not believe Trump has done anything that warrants impeachment. They might be wrong to think that he hasn't committed crimes, but that isn't really the point here. If they believe he has committed no crimes, their opposition to impeachment would seem rational. If he didn't commit the sort of crimes required for impeachment, he shouldn't be impeached. I'd also guess that many would say "yes" because they do believe that Trump has committed at least a few crimes that might justify impeachment. Again, they might be wrong about whether such crimes were committed, but they'd seem rational to support impeachment if they did believe the crimes were there. We have impeachment for some good reasons. 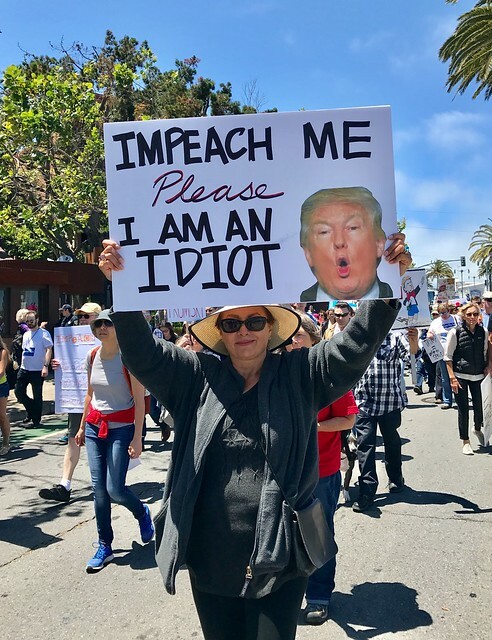 If a president commits the sort of crimes that support impeachment, he or she should be impeached. I find myself somewhat more interested in a couple other groups, though. Surely, some people would say "no" even though they suspect Trump has committed crimes because they regard him as above the law or simply don't care what laws he breaks as long as he pushes their agenda. I suspect more than a few evangelical fundamentalist Christians could be found in this group. This certainly sounds less rational, but I'm not sure it must be. Even though I'd strongly disagree with such a position, someone who decided that the benefits to them (i.e., a conservative Supreme Court) eclipse any qualms about overlooking the crimes of a president isn't necessarily acting irrationally. I'd also bet that there are some people who would say "yes" even though they aren't at all convinced that Trump is guilty of any crimes simply because they don't like him. I'd guess that more than a few liberal atheists could be found in this group. This would also seem somewhat less rational; however, just like the previous group, I'm not sure that must be the case. Perhaps this group concludes that Trump is so bad for the country that getting him out of office is worth it even if it were to be done based on no substantive crimes. In short, it would seem like someone could answer this question in either direction for reasons that were more or less rational. Maybe this is just one of my many idiosyncrasies that will make little sense to anyone else, but I can't help being more interested in why people think what they think than in what they think.